In Catalunya, we like to do strange things. One of them is called "Castells" (in English: "Castles"). 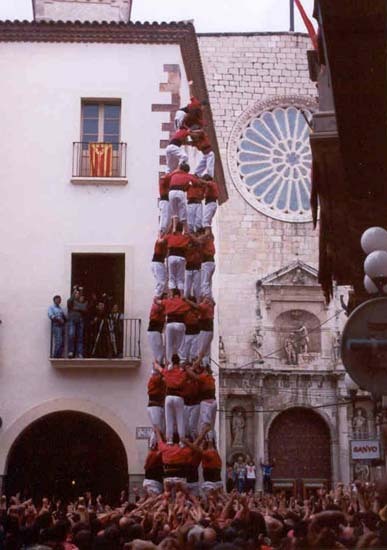 Here are the pictures of two "Castells" with 9 layers of people (called "castellers") respectively. The first castle has 4 people per layer. The other has 5 people per layer. The little kid at the top is usually a 5 or 6 year old boy or girl who receives the name "enxeneta". He or she usually climbs on one side of the castle and descends on the other side (he or she needs long legs to be able to pass over the top "casteller" without tumbling on him). 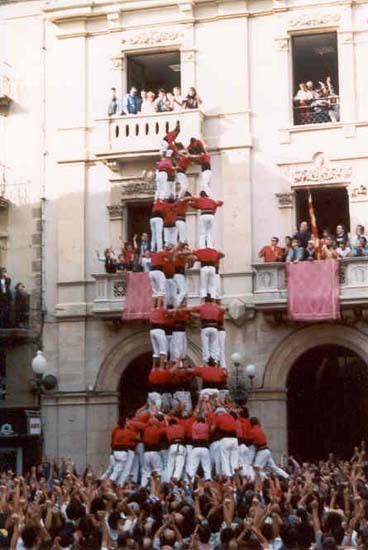 As soon as the "enxeneta" arrives at the top, the castle is crowned ("muntat"). The castle is considered complete when the last person from the bottom has dismounted. Notice that the castle with 5 persons per layer has two large crowds at the bottom, one on top of the other. The top layer is called "folre". Hence, the castle with 5 persons per layer (which contains the "folre") is called "5 of 9 with folre" whereas the other castle is called "4 of 9 without folre". These picture correspond to the Exhibition of the "Colla Jove dels Xiquets de Valls" during Santa Ursula's Festivities. The background sound for this page is the music that the "grallers" play when the castle is "built". It is plaid with an instrument called "gralla". At the bottom of the page there is a picture of a graller playing. The Graller's name is Xavier Bayer.